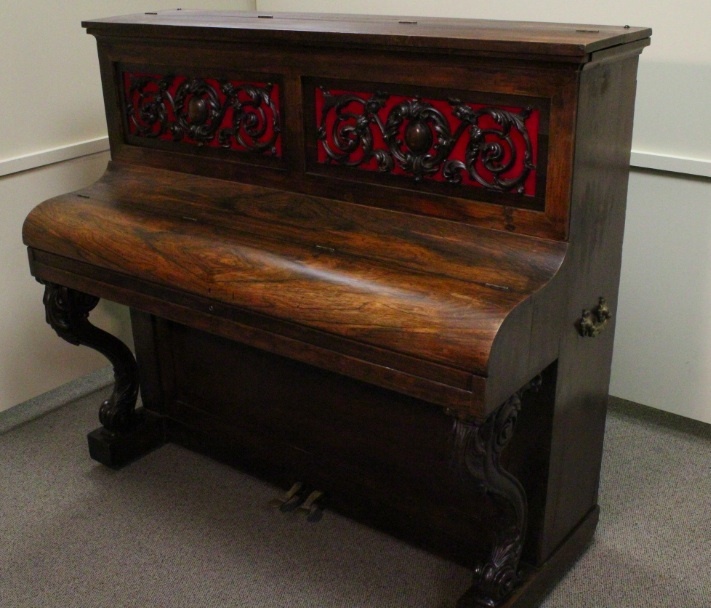 This piano was in Ford’s Theatre on Good Friday, April 14th, 1865 when president Lincoln was shot. The piano is a straight strung upright built by Jonas Chickering in Boston, Massachusetts in 1859. The piano was given to us in 2006 by the East Rochester City Hall, who got it from the Aeolian Corporation who built Chickering pianos from 1932 until 1985. Aeolian was given the piano by Laura Keene’s descendants in the early 1960s. They had the piano on display in the “shop” part of the factory for decades, occasionally sending it out for special exhibit. It was five days after Lee had surrendered to Grant and many were celebrating the end of the war. The comedy “Our American Cousin” was playing, starring Laura Keene, one of the most popular actresses of the day. It was also a benefit night for Laura Keene and the president wanted to boost attendance for her. This is the piano that Laura Keene brought from her room at the Metropolitan Hotel for several musical interludes to took place between the three acts of the play. She was to play the piano and sing a solo for the debut of a new song, “Honor to Our Soldiers”, written by the theatre’s conductor, William Whithers. Additional musicians were engaged to sing patriotic songs and to make the occasion even more joyous. This piano belonged to Laura Keene and was moved to the theatre just that day. It traveled with her by train to each town she would work in. When Lincoln was shot during the last act of the show, it is said that Laura Keene made her way to his box and cradled the president’s head in her lap while washing the blood from it, even though Mary Todd Lincoln was there, until he was moved across the street to the boarding house where he died. The piano went back to Laura Keene’s home, but she never played it again because of the painful memories.